Never lose contact with your customers! easyfind codes ensure that lost and forgotten items return quickly. In the event of a find, the owner can be contacted directly and anonymously. In addition, numbers of any kind can be turned into easyfind codes. Integrate your unique serial, chassis or ID numbers into easyfind codes or use our codes for various purposes! easyfind accessories are available in many different versions, all of which can be freely designed in shape and colour. With your logo and in your desired design they are already available from 100 pieces. Or would you like to equip your own products with an easyfind code? Switch to our page for resellers. Valuable items can be marked anonymously with easyfind accessories. If the item is found, it is reported on www.easyfind.com and the owner is automatically informed by e-mail and SMS. Useful: With easyfind accessories, objects can be recovered in the event of loss. This saves time, money and stress. Emotional: An annoying event (loss of an object) becomes a positive experience due to the quick return - your brand is positively "charged". Versatile: easyfind accessories are small, light and inexpensive - perfect as giveaways for mailings and events of all kinds. easyfind is a service in cooperation with Austrian and Swiss find solutions. Also available with additional functionalities such as shopping cart remover, tyre tread gauge or NFC finder. You integrate the easyfind code registration on your website (white label solution). When registering, you can, for example, point out to other products and services or offer newsletter subscriptions. In short, you distribute easyfind accessories to an anonymous group of people and can thus generate valuable leads. easyfind is a lost property service available throughout Europe. In the case of a find by an involved finding office, the owner of the item is automatically informed. Our customers include cities, municipalities, regions and transport companies such as airports, railways, etc. We produce easyfind accessories in your desired design - in any shape and in almost any material. Let your imagination soar! The easyfind shopping cart remover unlocks the shopping cart in a few seconds! Plug it in - unplug it - drive off! In addition, thanks to the easyfind code, the key ring is identified anonymously - contact can be made directly and anonymously in the event of loss. With the easyfind key fob made of stainless steel, the key ring can be identified anonymously. In case of loss, contact can be made directly and anonymously. Our high-quality suitcase tags are perfect for anonymous identification of all types of bags. Once attached to the luggage, it is reliably marked without personal data being exposed to others. The easyfind code is read directly with a smartphone or scanned using a QR code reader. This allows direct and anonymous contact with the owner. easyfind stickers are particularly suitable for protecting objects with a smooth surface such as cameras, mobile phones, sports equipment. An additional UV laminate coating protects the stickers against all weather conditions, which makes them ideal for outdoor use. easyfind childs tags are the ideal companion for the youngest. Quickly and easily attached to the backpack, it can be quickly assigned in case of loss. So parents and child have one less worry. easyfind animal tags are not only an elegant accessory for four-legged friends, but also bring them back when they go on unplanned excursions. The finder can contact you directly and your pet will return home as soon as possible. easyfind accessories are available in almost all shapes, colours and materials. We produce easyfind accessories in your desired design from 100 pieces. We are looking forward to your request! There are also many possibilities for packaging. In any case, your brand gets a strong appearance. 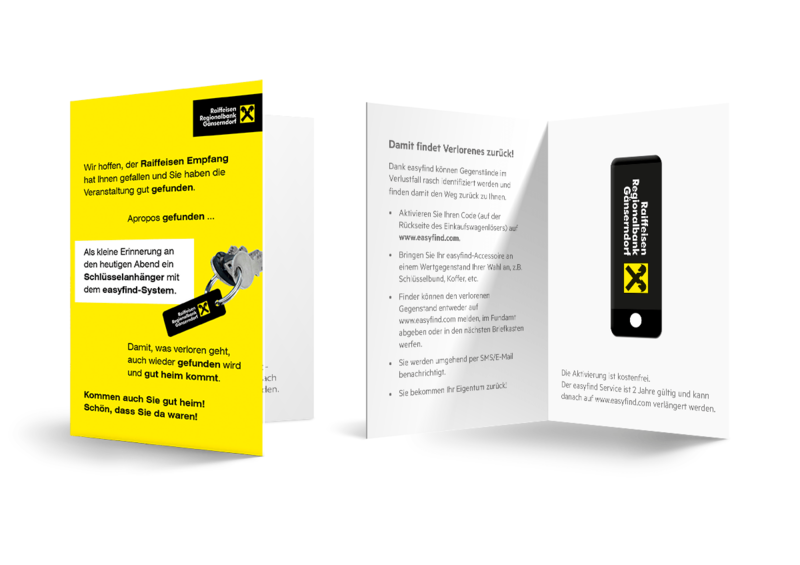 In addition to your branding and your advertising message, the information card explains how the easyfind service works (activation and find message). We produce easyfind accessories in your desired design from 100 pieces. The perfect extension to easyfind! Nova Find - the leading Lost & Found software in Europe! Nova Find is the perfect extension to easyfind! The web-based solution meets all requirements of a modern Lost & Found system. The focus is on sophisticated search technology, high return rates, simple management of found objects, reduced communication costs and short storage times to reduce costs. But above all it enables networked online search in all participating databases.